In December, I joined the dark side and got a Microsoft Surface Pro 6. I purchased the Surface Pro for the purpose of productivity with portability and ease without having to drag a laptop everywhere. In my experience, laptops seem to be somewhat delicate devices, with hinges that can be easily defeated by a toddler. I was looking for something that would survive if it inadvertently fell into small hands. While I do have an iPad Pro, at the end of the day it just is not a computer. While it can do most of what I want it to, and there are still too many gaps for my usage pattern. I decided to go with the the Surface Pro 6 on a Black Friday special. In January, the Surface Pro 6 decided not to charge any more. I noticed when it had 22% battery life left, so troubleshooting was limited. I took it to the Microsoft store later that week, and received a replacement with ease. I was pleasantly surprised with my experience, since they could not get it to charge their either, and my charger worked fine with another surface, they handed me a brand new one. There was just small problem with this. Since the device would not power on or charge, it meant my data was gone. Lucky for me, it did not matter, and I did not lose a thing. I think the gentleman helping me at the Microsoft store was sort of shocked when I shrugged and said it was fine and I had all my stuff in the cloud anyway. He looked a little worried to tell me that I had lost everything, and I am sure he is met with tears and outrage on a regular basis. Truth be told, it was a good feeling to not care about the device itself. While we tend to form an attachment to our computing devices, at the end of the day their only purpose to work for us. Luckily my Surface was still in warranty so the replacement was free, I may have cared a little more if the replacement cost me money. The only thing I did after the fact was force a logout of services I used on that device, just in case it ever turned back on someday, and someone got passed my password (stay tuned for an article on the security concerns of losing a device). 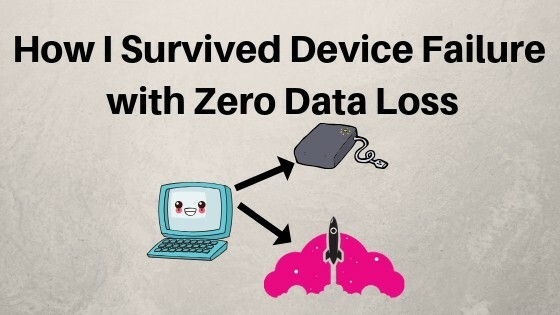 Most people won’t be able to shrug off the data loss associated with a dead device, and had it been a few years earlier, I may have been in the same boat. There is one simple reason why I did not lose data, there was no data on the device to lose. I kept everything in the cloud, and it all originated on another device, so there was literally nothing on the device I cared about. Is living solely in the cloud for everyone? Maybe, maybe not. If you really want to avoid data loss, there is one rule to follow. When you think about it, for environments hosted in a data center, this rule is very obtainable. For the average home consumer, it can be overwhelming to think of. I first started practicing the 3-2-1 rule for my personal data in 2016 as I worked on my VCDX design, and when you think about it, it can implemented at home in a number of different ways. For a regular computer user that does not design IT infrastructure, this rule may seem like overkill, but is it really? Do you really want to lose your pictures and personal data? Here is a very simple breakdown anyone can follow, even if they are not a computer power user. Your data has to originate someplace, and that is your computing device. It could be a laptop, a desktop, a tablet, or anything else you can think of. This is your first copy of your data, and the copy you work with the most. Hopefully you are backing up your primary computing device. There are a number of ways to do this based on the type of device you use. Since I am a computer person, I have a NAS device at home my devices back up to. While this type of device is overkill for many users, a simple external hard drive can do the trick. 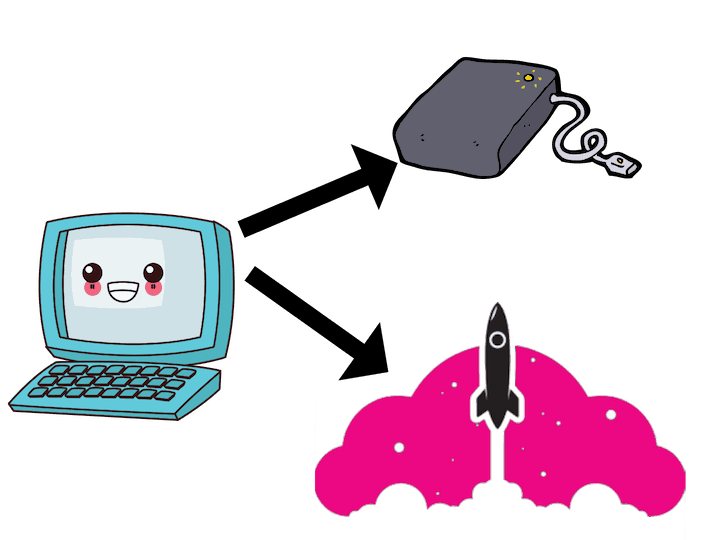 Many today even support wireless connections to make backup as easy as possible. Today, using the cloud is sort of a no brainier for consumers, and many cloud products offer free versions with more than enough space, and even premium plans are available at a very low cost. As a bonus, leveraging the cloud makes it easy to access your data across devices, anytime, anyplace. By following this simple rule, I am empowered to not care about my physical computing devices. Does this mean I will go smash one up for fun? Of course it does not, but I do not need the extra worry about what is going to happen to all my digital stuff when my Surface turns into an expensive paper weight. I did not start protecting my data until I really had a need to several years ago. Imagine losing months of work due to a computer hardware failure. I did not want to imagine that scenario, so I put the 3-2-1 rule into practice and have not looked back. Ask yourself the simple question, “What would happen if my computer stopped working?”. If you answer this with anything other than a nonchalant answer, it is time to implement the 3-2-1 rule and start making sure your data is available today.